If you asked me what’s the one thing I learned from my Toronto trip, I would tell you: Toronto is not a walkable city. I realized I made the mistake of underestimating the distance to destinations when my feet started hurting and cracking after 2 days of excessive walking. A route might look close enough to walk on the map, in reality it is often further than expected. Unless you have a healthy budget for transportation, do yourself a favour and purchase a PRESTO card. Not only does it give you a discount for getting in to the city from Pearson Airport, but also lets you take public transportation without the hassle to keep finding cash to pay for the tickets. Subway and streetcars are the most inexpensive and convenient way to get around Toronto and you should take advantage of it. Now grab your Presto card and explore the city with me! Before we dive into Toronto’s subway system, let’s talk about PRESTO cards. As mentioned in my previous UP Express post, it is a prepaid electronic fare card that allows you to pay transit fare electronically. Currently, it can be used on all streetcars, 30 subway stations, as well as GO Transit, Union Pearson Express, eight other Greater Toronto Area transit agencies and on OC Transpo in Ottawa. By the end of 2016, PRESTO will be installed at all subway stations and on all buses. One of the biggest advantage of having a PRESTO card is that when taking the UP Express from Pearson Airport to downtown Union Station, the card gives you $3 discount on the $12 regular fare. Thus, if you plan to take the public transport frequently, it is a no-brainer to buy a card! You can purchase a PRESTO card online (if you have a Canada mailing address) or in person at selected stations. The card itself costs $6.00 and each ride (subway/streetcar) costs $2.90. 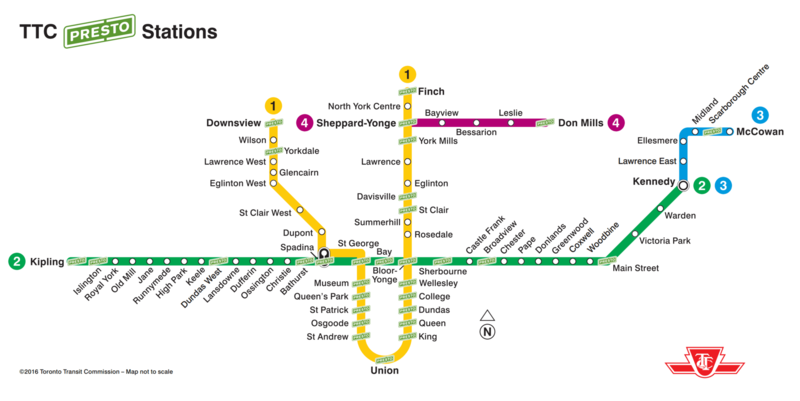 Line 1: Yonge-University Line, Toronto’s oldest and busiest subway line running in a south and north direction forming a U-shaped route. The stations cover Yonge Street and most of the University district, hence the name Yonge-University Line. Line 2: Bloor-Danforth Line, which runs in an east and west direction along Bloor Street. Line 3: Scarborough Line, a L-shape route with 6 stations extending eastward into Scarborough. Line 4: Sheppard Line, which has 5 stations that runs along Sheppard Avenue East. Most attractions can be reached by line 1 or 2, with a transfer to streetcars which we will discussed in the latter portion of this post. Line 3 and 4 will take you to suburban areas. Below is the most updated subway map (as of June 2016) with an indication of stations where PRESTO has been installed. How to take TTC Subway? Finding a subway station is not an easy task. Instead of a standalone station, most of the subway stations in Toronto are hidden inside a building. The best way to identify a station is to look for the TTC sign. When you spot one, it means you’re close and the entrance to the subway station is nearby. For stations that have PRESTO installed, you simply tap your PRESTO card on the card reader at the front of the turnstile. The fare will automatically be deducted from your card. If you need to transfer to a bus later, go to the transfer machine inside the paid area near the entrance and take a transfer ticket. That will be your proof-of-payment which you need to carry it and show it when you board the bus. Note: Since PRESTO has not been fully rolled out at all stations and buses, it is strongly advised to carry some cash with you in the event the station or vehicle is not yet PRESTO-equipped. To ensure you arrive at the correct platform, follow the sign of the subway line and direction you’re traveling towards. Most of the time, it is fairly self-explanatory. All you need to do is check: 1) the subway line number and 2) the direction (northbound, southbound, eastbound, westbound). In the event you’re unsure about the direction, check the last station of the route is correct. Line 1 has a U-shaped route so it can get a little tricky. At Union Station, you will see 2 northbound platforms: one called University Line, the other one Yonge Line. Yonge line is running along Yonge Street, bounding for Finch Station. University line, on the other hand, runs through University district and bounds for Downsview Station. Make sure you check that prior to boarding a train! Yay, the difficult part is over! Now just enjoy the ride and disembark at your destination station. Remember, when exit a station, you DO NOT need to tap your PRESTO card. Let’s talk about streetcars, which is known in some parts of the world as trams or trolleys. TTC has an extensive streetcar network that covers the city with 11 routes. Most of the streetcars operate above-ground through downtown Toronto, covering areas that subway do not have access to. For me, streetcars are far more convenient than subway. I took them everyday and more frequently than subway. Moreover, most restaurants are nestled on Queen Street West, King Street West and Ossington Avenue, which are only accessible by streetcars (not subway). How do you know if there is a streetcar stop? Look for a white pole with red bands and a streetcar icon. Most stops are found on the sidewalk just like a bus stop. You will have to wait until a streetcar stops (usually in the middle lane of a street – it is weird, I know, don’t ask me why), then walk out onto the street and board it. In some cases, the stop and waiting area are found on a separate platform along the tracks. All streetcars have PRESTO installed so tap your PRESTO card on the card reader when you board. Similar to subway, when you embark, you don’t need to tap again. There are 2 types of streetcars you will see around Toronto: legacy and new streetcars. Besides having a more modern design, the new streetcars have a card reader installed at all doors so you can enter from either the front or centre doors. For legacy streetcars, you can only enter from the front door since that is where the card reader is placed. In addition, the new streetcars have the Fares and Transfer Machine onboard near the centre doors. You can pay the fare or take a transfer ticket from the machine if you are transferring to a bus later on. On legacy streetcars, you will need to ask the operator for a transfer ticket. Subway and streetcars are the way to go if you’re looking for an inexpensive, convenient way to get around Toronto. Both run very frequently and many of the streetcar routes are a great way to explore the city. Hop on to the 501 Queen streetcar, which is not only the longest streetcar route operating in North America, but also one of the world’s top 10 trolley rides listed by National Geographic. It will take your through many different neighbourhoods and landscape, demonstrating Toronto’s diverse and vibrant heritage. Great instructions! I don’t think I’ve even taken the subway. We don’t get to the big cities very often. The streetcars look cool. I’m impressed! I live in Toronto but am one of those people who drives everywhere :(. You taught me about the Presto card – thanks!! Some great tips. It’s always good to know how to get around a new city. I love when cities have something like a Presto card. Makes it so much easier. I have so many from all over too! This is a great guide! I actually had to catch the subway a few times on a recent trip and kept getting absolutely lost in the central station. It’s like a maze in there. Very good instructions. It’s always good to know how to get around in a big city and the subway is your best bet. I live in Los Angeles where we mainly drive our own cars, but whenever I go somewhere where there is public transportation I feel kind of lost. Toronto sounds exactly like Los Angeles. You need a mode of transportation other than your feet in here. I am a fan of walking but if the walking is going to take a lot of your precious time in a city you are visiting, then using public transportation sounds like a good idea. Hey, it is in there for a reason! This post is a great reference for anyone visiting Toronto. As you say it is quite a spread out area and on our only visit in 2010, we found ourselves catching busses and trams and the odd subway trip too so this card would be a great bonus. I love posts like this that straight up spell out for you how to ride a foreign city’s subway cause I always end up standing there like a doofus in the way, holding up the line! Super detailed – a great help for people visiting the city! We believe the great way to explore any city is to travel like a local use public transport but many wont dare for lack of information. Glad that you shared some great information here. Such detailed instructions! Thank you! Great info! Toronto is on my bucket list, so this will be super helpful if I ever make it there! This is pretty valuable information. We generally use the public transportation system in big cities, as this is convenient and cost effective. Another added bonus is that it is a great way to interact with the local people. This is all really good to know. With uber being so popular now, I’m trying not to get tempted to call uber every time I need a ride. Public transit is a great way to explore a city instead. In my opinion everything should be accessible with this type of card system. This one makes the place very inviting and accessible for people wanting to spend some time going around Toronto. Glad to learn some tidbits about their street cars as well! I love using the subway, Cat! I find it as a quite cheaper way of travelling! I am moving to Toronto next month, so this is really helpful, thank you !! Hi Cat! I was wondering if you know how to get a SIM Card for an unlocked phone? So I can always stay in touch back in my home country. I’ve been researching by myself but the options I got are too expensive compared to the GB they offer. Hi Alex, you can look into Roam Mobility (https://roammobility.ca/) 🙂 That’s what we normally use when traveling in North America. Hope this helps! If you are traveling to one of the big cities and are planning to use the public transport, then it is so necessary to understand the system. We usually do that whether it is Rome or Switzerland or Thailand. This post is very useful in that context for people traveling to Toronto. This is really informative blog. Having a cup of coffee and read your blog is really nice and got know so many things.